New York-based collaborative workspace WeWork opens its first Philippine location at Uptown Bonifacio Tower Three in Bonifacio Global City on the heels of strengthening its reach in Southeast Asia. DYNAMIC. WeWork opens its first Philippine location at Uptown Bonifacio Tower Three, offering members a workspace that fosters creativity and collaboration. The co-working space, on the 9th and 10th floors of Uptown Bonifacio Tower Three Building, can accommodate over 800 WeWork members, bringing the network’s total members in the region to over 13,000. WeWork currently has 425 physical locations in 100 cities in 27 countries. Driven by its expansions in 2018, its Southeast Asia stronghold has seen its footprint grow to 17 locations. Freelancers, startups, MSMEs, and enterprises on the lookout for enhancing their work environment and elevating their businesses to the next stage will be further empowered by its global network. “With Philippines a rising economy in Southeast Asia, there is no better time to be here than now. As our footprint continues to grow in Manila, we are committed to helping Philippine-based enterprises, freelancers, startups, and MSMEs by harnessing the power of WeWork’s global network and community,” said WeWork Southeast Asia managing director Turochas “T” Fuad. The pantry is filled with various beverages and snacks for members. Testament to its local commitment to further accelerate the future of work in the dynamic Filipino market, WeWork Uptown Bonifacio boasts thoughtfully curated elements such as a games and karaoke room and an indoor garden area on the 10th floor among its signature features. The indoor garden is inspired by the Philippine islands, where artificial turf mounds with planters and swings cover the length of the corridor, while also showcasing the vivid mural by Bitto. “WeWork is not just about the space, but also the value that we create by providing an inclusive member-driven experience that fosters an environment of creativity and collaboration across a vibrant global community of individuals,” enthused Fuad. The indoor garden on the 10th floor provides ample space for contemplation and relaxation. 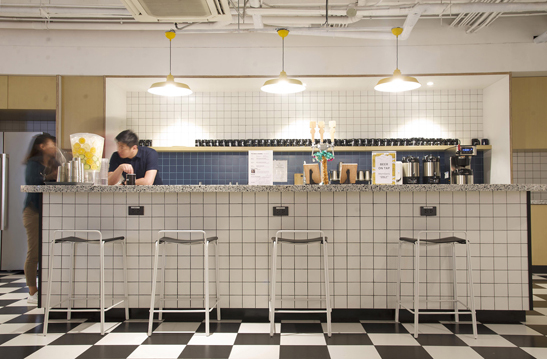 The co-working space harnesses ample natural light and various open-air meeting places. A healthy dose of greenery brings life to the space. Pops of color, as in the mint-colored ceiling feature and mural made by WeWork’s arts and graphics team and Bitto, complement the dynamic environment. “Apart from creating habitats for creativity and focus, our goal is to shape truly dynamic environments that aim to create better experiences where our members are inspired to go to work everyday,” said Fuad. 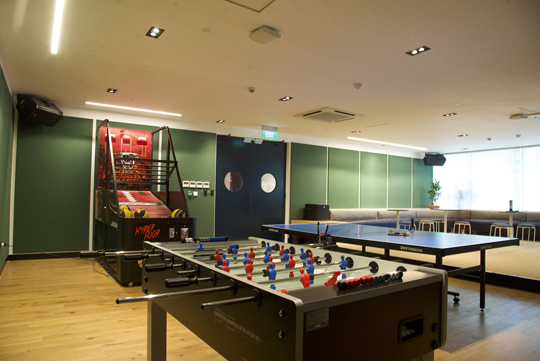 WeWork’s Gaming and Karaoke Room is one of the highlights of the dynamic co-working space. WeWork bridges the gap between physical spaces and digital platforms by utilizing software and data to ensure its spaces are designed and built efficiently and that its communities are connected, productive and, ultimately, happy. Members are connected through the WeWork Members Network App, WeWork’s in-house mobile technology. From left: Edukasyon.ph chief of strategy Judge Calimbahin, Klook Philippines market lead Michelle Cruz, WeWork director of engineering Beverly Dolor, Taguig City deputy chief of staff Maricar Loinaz-Sarmiento, WeWork managing director for Southeast Asia Turochas Fuad, Megaworld senior vice president Jericho Go, and Megaworld vice president JP Balboa. 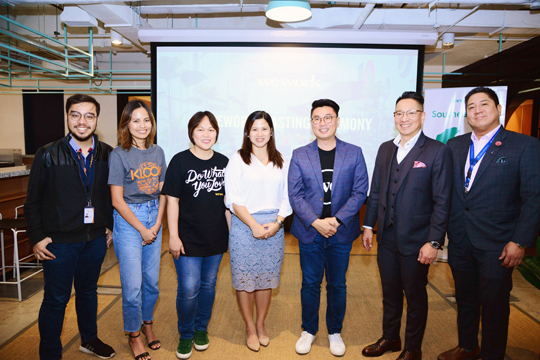 WeWork welcomes members ranging from global enterprises to organizations such as education technology enterprise Edukasyon.ph, activities booking platform Klook, and cashback reward startup Shopback. 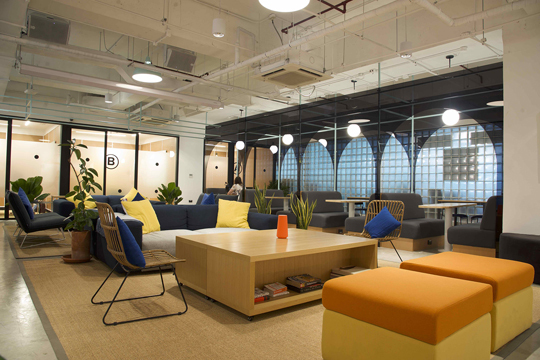 “We were looking for an efficient and productive working space that would enable us to continuously optimize, innovate, and up our game, so WeWork became a natural fit for us,” said Judge Calimbahin, chief of strategy at Edukasyon.ph.